How well do you know your man? How much do you love him? These questions should be on your mind when you pick the perfect wedding ring for him. You have to choose one that’s true to who he is, one that’s also built for the kind of world he lives in and loves, and one that undeniably says how much you love and support him. Since you’re reading this post, it’s safe to assume that you love an avid deer hunter, right? You already know that to your country boy, hunting isn’t just a sport, but a way of life! This is the one thing (aside from you and your children or future children, of course) that’s near and dear to his heart. 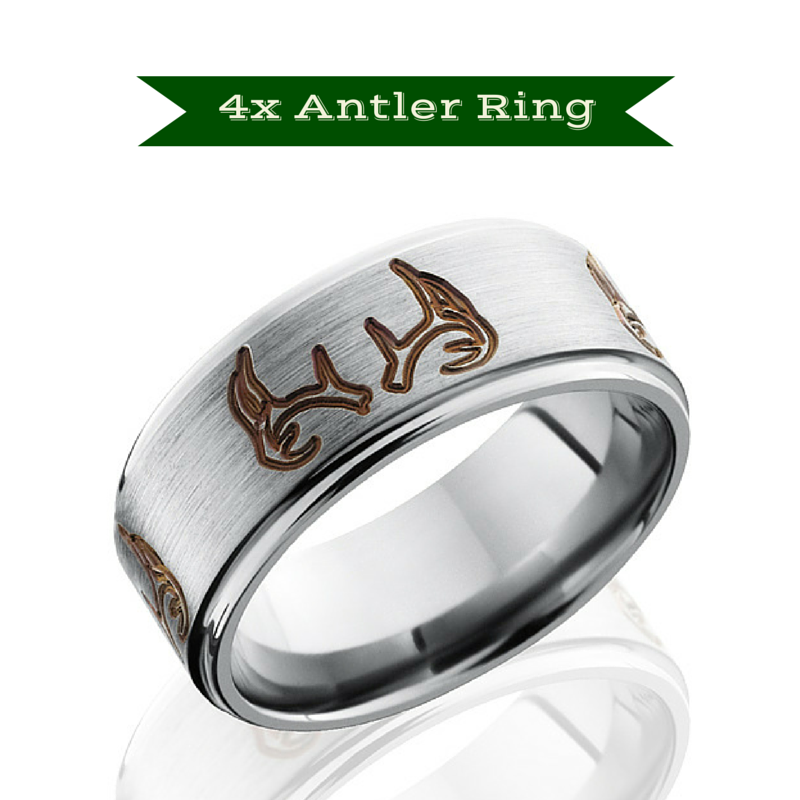 A lightweight antler ring is just what a rugged outdoorsman needs! The cool antler design, the edging, and the finishes of this 8 mm Titanium ring is what makes it so awesome! It has brown deer antlers engraved and equally spaced on all four sides. It has a flat profile, a satin finish top and grooved polished edges. Since the popularity of black rings have risen to a higher level, this 8 mm Black Zirconium flat profile ring will be big hit! It features carved deer tracks around the entire ring, and at the center, you'll find 1 carved antler design. The design is silver since it is carved on the metal so it inner silver colored layer of the Black Zirconium ring is exposed. Here’s another unique wedding band fit for your rugged deer hunter. It’s not your ordinary circle, this one’s a square! This square shaped Titanium ring has a flat profile and grooved edges, and it has a pattern of repeating deer antlers all around it. It features an antler design that’s raised on the metal while the background area of the ring is black. 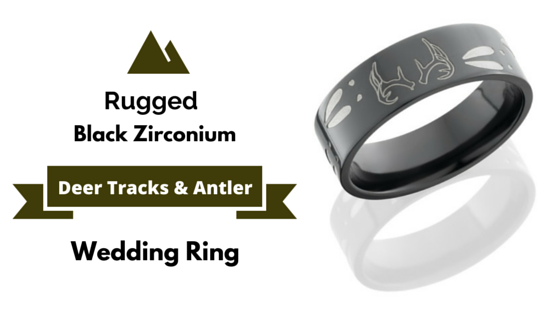 This is, no doubt, another cool wedding ring idea for your deer hunter. It is 8 mm wide and features a flat profile with a pattern of repeating deer antlers (black color) that are laser engraved all around it. It is made of the lightest metal, Titanium, so wearing it wouldn’t feel weird and heavy. This 8 mm two-toned Black Zirconium wedding ring will remind him of the excitement he feels every time he spots fresh deer tracks. It features a flat profile with a pattern of repeating deer tracks. The deer tracks are black and are raised on the metal and the edges are black too. The black outer layer of the ring is the finished product of the process of oxidation and serves as a strong protective layer. The black color is guaranteed to last forever. The background of the ring is a silver color since it exposes the inner layer of the ring. Why not have real antlers on his wedding ring? Yes, he can have 4 mm of real antler inlay on his very durable and lightweight Vitalium band. We guarantee that it is genuine deer antler. It will look swell on his finger! The entire 8 mm wide band has deer heads all around it. It is forged with Vitalium, a super durable and scratch resistant brilliant metal. Deer heads on this ring come all facing the same direction unless you make a note on your order to have them alternating. Your avid hunter would want to have this 8 mm Black Zirconium wedding ring featuring a flat profile with a pattern of deer tracks. The deer tracks are carved on the metal so it turns out silver because it exposes the inner silver colored layer of the Black Zirconium ring. If you love the thrill of hunting and trailing deer, you’ll love this ring! If he doesn’t like shiny rings, this wedding ring might suit him. It features a flat profile with a pattern of repeating deer tracks. The deer tracks design is raised on the metal and the edges have a lovely satin finish (not polished) while the background area of the ring has a sandblasted finish. Not only does it look good and stylish, it is super lightweight because it is made of Titanium. If he wants a super thick and durable wedding ring that he can take with him on his hunting trips, this 9 mm flat band with grooved edges is perfect! It has a very detailed deer antler and tracks pattern engraved all around it. The top has a satin finish while the edge has a polished finish. Plus, you get to choose any of these three super durable and scratch-resistant metals: Titanium, Cobalt Chrome, or Black Zirconium. All of the rings offered at Camokix are made of very high quality metals that are built to endure even the harshest environments and conditions, so it will be perfect for any hunter! Depending on the style, it may take as early as two weeks to close to 5 weeks to ship because these rings are custom made just for you! So be sure to order them weeks before your special day!